Looking for peaceful country living? Here is an opportunity for a 7 +/- acre acreage loaded with potential, located just off a tar road with a house that has over 3,100 total sq. ft.
Have you been looking for a peaceful and affordable acreage in the country, with great views and a large house? This 7.01 acre acreage is located less than a ¼ mile off of a tar road, with easy access to Hwy 13. The property has a home built in 1978 with over 3,100 total sq. ft., 4 bedrooms and 3 baths. 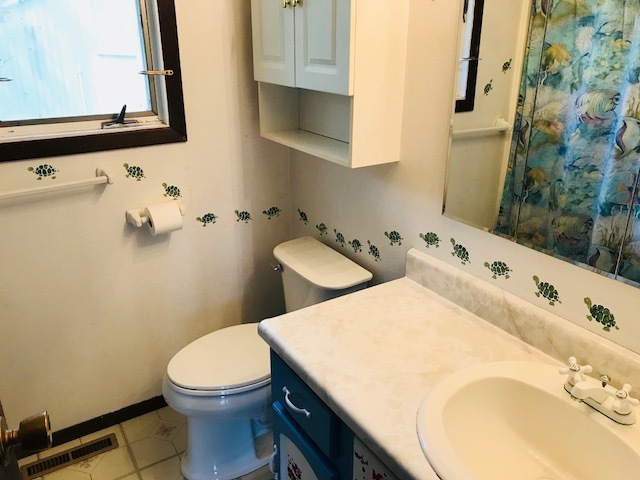 The house also features an upstairs master suite with a private bath, a walkout balcony, and an attached enclosed hot tub room with a hot tub (needs minor repairs). The kitchen is spacious and has newer appliances and in adjacent to a nice pantry and also main floor laundry. The house rural water, central air, and has a wood burning stove on the main level. The basement has a legal bedroom and full bath with a jet tub. The basement is primarily considered “unfinished”, but could easily be finished to your desired specifics. The property also has a detached 2 stall insulated garage, a 32×48 pole building, and other out buildings; some with good use potential and some in poor condition. The property has lots of privacy with mature trees, room for animals, and beautiful views overlooking a ridge and stream. Drive a little to save a lot applies to this peaceful and spacious acreage, loaded with potential! The seller has moved, don’t miss this opportunity! We invite you to inspect this property any time. For additional info. contact the Auctioneers & Realtors. This place is loaded with potential & is ready for you to enjoy! COME PREPARED TO BUY! Personal Property: Guns – Tools – Tractor – Riding Mowers – Push Mowers – Lawn Tools – Snow Blowers – Car – Antiques – Commercial Growing & Gardening Equipment – Gun Safes – Bows – Like New Cooking & Meat Processing Equipment – Fodder Systems – Electric Indoor Grow Box System – Nice Wood Furniture – Older Wood Furniture – Tillers – ATV – Log Splitters – Sickle Mower – Scopes – Fishing Items – Something For Everyone, Lots of Items!!! Newer Samsung Washer & Dryer; Many Military Trunks; Antique Plow; Post Hole Auger; Chain Saws; Craftsman Wood Chipper; Drill Press; Electric Welder; Table Saw; Barb Wire; Electric Fuel Tank; Timber Posts; T Posts; Shop Lights; Tool Chests; Large 2 Wheel Cart; Tool Box’s; Jacks; Sprayers; Grinder; Gas Cans; Straps; Saws; Shovels; Shop Tools; Grease Guns; Chains; Cutters; Clippers; Trimmers; Hammers; Wrench Sets; Concrete Tools; Wheel Barrow’s; Ladders; Garage Door in Box; Pitch Forks; Wagons; Ramps; Heaters; Antique Sleds; 100+ Sq. Straw Bales (2-3 Yrs. Old); Many Old Records; Mounting Items; Old Crates; Older Dressers; Dining Table & Chairs; Patio Chairs; Old Benches; Wall Clock; Wood Cabinet; Older Large Book Shelf; Wood Chairs; Sewing Machine; Many Outdoors Prints; Glass Jugs; Stands; Folding Table; Beehive (In Box); File Cabinets; Coolers; Older Pots; Safe; Old Dolls; Toys; Stool; Exercise Station; Deep Freezer; Misc. Decorations; Lots of Hand Tools & Misc. Antique & Older Items! TERMS: 5% non-refundable earnest money deposit due day of sale with balance due on or before July 13, 2018. Title Insurance and Closing Fee split 50/50 between buyer and seller. Taxes prorated to closing. Property is sold as is, where is without warrantees or contingencies, and subject to existing easements, restrictions, and subject to confirmation of owners. Information and statements contained herein believed to be accurate but not guaranteed. For full terms contact auctioneers. Auctioneers represent the sellers in this transaction.